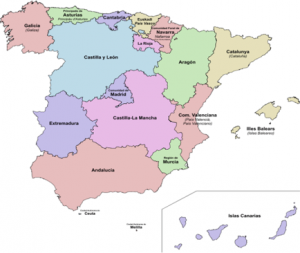 As of January 1, 2014, Spain had a total population of 46,507,760, which represents a 0.5% decrease since 2013. The CIA Factbook (2011) gives a racial description of "composite of Mediterranean and Nordic types" under "ethnic groups" instead of the usual breakdown of ethnic composition. This reflects the formation of the modern Kingdom of Spain by the accretion of several independent Iberian realms, i.e., León, Castile, Navarre, the Crown of Aragon, Granada, etc. Spain's population peaked in 2012, at 46,818,216 people. Spain's official population fell by 206,000 to 47.1 million, mostly because of immigrants returning home due to the effects of the European economic and fiscal crisis. Its population density, at 91.4 inhabitants per square kilometre (237/sq mi), is lower than that of most Western European countries. With the exception of the capital Madrid, the most densely populated areas lie around the coast. The population of Spain doubled during the twentieth century as a result of the spectacular demographic boom in the 1960s and early 1970s. After that time, the birth rate plunged through the 1980s and Spain's population became stalled, its demographics showing one of the lowest sub replacement fertility rates in the world, only above Greece, Portugal, Hungary, Ukraine, and Japan. Many demographers have linked Spain's very low fertility rate to the country's lack of any real family planning policy. Spain spends the least on family support out all western European countries—0.5% of GDP. A graphic illustration of the enormous social gulf in this field is the fact that a Spanish family would need to have 57 children to enjoy the same financial support as a family with 3 children in Luxembourg.